What would be potentiometer here? typically is the C500k (reverse log) but any 500K pot will work ,you just wont get the same taper of gain increase. what type of caps I have to use for best result (this brown on picture)? ceramic or film or film(box)? I have used ceramic radial yet, nut I read, that film is for audio use better. the pot is wired backwards in this layout. I've just built and verified it, 1uF doesn't need to be electrolytic, here's an updated image with the minor corrections http://i102.photobucket.com/albums/m112/monkeyxx/MXRMicroampmicroampsmallerVERIFIED.png one of my all time favorite effects! you have pictures of how it works ? Thanks for the heads-up Dan, I'll alter the layout. Unfortunately sometimes the schematics don't seem to follow the correct convention for pot numbering so this does happen from time to time with things I haven't built yet. when in bypass mode, the unit oscillates when the gain pot is at maximim. Also had this problem. Solved it with the Skreddy type 3PDT wiring. At first I tried to up the 47p cap but it wouldn't work. When I got rid of the oscillation it strated to kill the tone. Grounded bypass is the way to go. Now it only oscillates when the pedal is ON but nothing is plugged to the input jack. Not a half bad pedal, actually. It does that in bypass? How have you wired the switch? I tend to use Skreddy type wiring so that in bypass the effect input is grounded which helps to prevent any sort of bleed through. Hey Mark what about this?can you transfer to vero? what direction is the 1uf cap if i use a polarised one? also, would a 22uf be ok as a substitute for the 15uf? No LED on this one? I normally only add an LED resistor if there is room to fit one in without having to add an additional column. It's easy enough to add though to any of these layouts if you want to. Just add a column and take a resistor between the 9V row and a free row on the bottom right. Also add an appropriate cut if necessary. I've omitted the LED from my layouts too. Reason being that i've found wiring it offboard to be just a cool way to do it. I usually solder both wires to the LED, protect the solder joints with heatshrink and then solder the resistor as extension to the + wire. Seal that with heatshrink too. Now there's the resistor's lead that can easily be soldered to the DC jack with the board's red wire. This way the wiring is usually even neater than with onboard LED resistor. I want to make an eq pedal to use it with bass guitar. 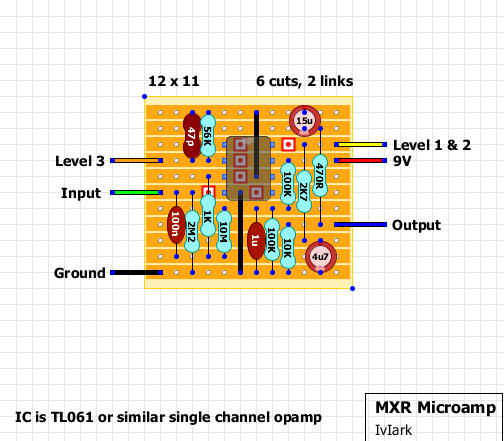 Would it work if I use this schematic (http://i395.photobucket.com/albums/pp31/mothercruncher/Guitar%20Pedal%20Builds/3bandEQ.gif) and put the microamp after it? guys please help me out. i've been messing around for hours on this. i dont get sound out of it. only crackle. i even soldered averything on a new base plate. i dont thing the traces touch each other. Dude you use waaaay too much solder. I'm hoping that that's camera playing tricks in the first picture because solder isn't supposed to be that dull grey color, rather silvery and shiny. You are just asking for trouble with cold joints when you use that much solder. I also don't know how you managed to melt the ic socket plastic, that also shouldn't happen, ever. Or is that some sort of goop, also underneath the electrolytic in the second picture, board top left? D'OH! i soldered that thing mirror inverted. so the IC had no chance to get the connections right. DAMN! now everything works. great! thanks for that layout. it looks like you're using a type of solder that is not flux-cored. try to find a solder that's labeled "flux core solder" it will be much easier to melt and flow and wont require you to cook the entire board like that. i had always problems with that solder! i bought some new and soldered everything again. i only got desperate, thats why i used so much solder. hehe. I have made this, and it works. However, the odd thing is that it only works without the 2m2 resistor. Does anyone have any suggestions as to why? Thanks! The 2m2 is just a pulldown resistor to stop popping from the switch and so it isn't necessary for the effect to work. If it isn't working with the 2m2 in there then there may be a fault with your resistor. If it is damaged and creating a short then the entire signal will be dumped to ground before it even hits the circuit. If you are getting any popping then try a different 2m2. If not just leave it out. I used 2 1M resistors wired in series for the pulldown and I'm still getting popping. I tried 1M and still have popping. Any suggestions? Hi there, this is my first post and I'm french and a dummy on DIY stompbox. So sorry for my futur stupid question and for the poor langage I'll use. Anyway, I've just received Your MXR Microamp Kit from Bitbox, and I was wondering what was the good type of enclosure I had to choose. I also have the same question for the analog delay kit. Many thanks for your answers, and for this amazing site. Hi. I used a electrolitic 1uF 63V capacitor with negative on the ground. The rest is identical to this vero, but.... it doesn't sound. Cuts, links and components are fine. How are the IC pin voltages? Hi Mirosol. Thanks for your fast reply!!! The important ones in this are 4 and 7 which are ground and supply, so they look fine, and 2, 3 and 6 which are the inputs and output. So pin 3 is looking suspect to me, I would expect that to be more than 0.4V. Are you sure the resistor going to pin 3 is 1K? Yup. There's definitely something wrong with pin 3. It should be closer to that 4.68V you got on pin 2. Probably wrong component value or some type of tiny short causing it to have near zero voltage. It should be fine. It is brown, black, black, brown, brown, so 1k 1%. My circuit is working, get unity gain even with pot turned right down...? Then boost of full volume when fully turned up. Using c500k ... Any suggestions? Should i use linear? What could be wrong? same problem here, anyone knows what could be the problem? Also i tried another TL061, supposing that the IC may be factory incorrect or something, getting the same scenario. Whenever this stuff happens it usually means there's something wrong going on. I often find that if I'm tired when building a vero that I have put something in the wrong place or completely omitted a part or something. Check over all your joints, make sure all the parts are in place and oriented correctly, and ensure your offboard wiring is ok! 99% of the time it's something like this and not a component failure. I'm positive that there was no popping when the parts were on the protoboard. Could it do something with the distance between the caps or something? The parts were ofcourse differently arranged on the protoboard. Is there perhaps some grounding trick on where should the wires exactly be connected to? I have wired the offboard exactly as specifiend on Marks post on this site. So you added an LED and a 3PDT switch? Have you tried adding a pulldown resistor? Put a 1M to 4M resistor from the input of the circuit board to ground (the bottom row). there is already a 2.2M pulldown resistor in the layout...maybe you could try a 100R resistor in series with the 9V wire and see what happens. I had the same problem too, my 3rd try was a success and trying it out on my other pedals. I am facing inconsistent out come from this....sometimes it boost the volume and sometimes it went softer than the effect (3/4 position). Does anyone face this, or have a solution to this problem? I'm kind of a beginner, I built several pedal effects but using printed PCBs, so this is actually the second project I try to build on a perfboard. the first time it worked PERFECTLY, until I had to change the dc jack of the pedal (for a mistake, i bought a 2.5mm dc jack, but i wanted to use it with my power pedal which has only 2.1mm plugs): I desoldered a couple of wires and then it started to behave very badly. No signal, and lots of scratches. Desperate, I rebuilt another one, with the same result: no signal or lots of scratches. I decided to rebuild it for the third time, this time on a breadboard. Everything perfect, it worked as it should. So I wrote down all the voltages of the IC, and did the same with the ones of the perfboards. What i saw is that on the other two, pin 2 and 6 were lower than they should be. I tried to "re-heat" every joint of both circuits: the first started to work again!! but with some hum.. and the second gave me a very low volume signal. So, I managed i was dealing with cold joints. Finally, I read the post of Denny G. and the reply of Goran Protega. Goran told him he was using too much solder. Maybe i have the same problem? Too much solder?? PLEASE let me know!!! I made this pedal, it works very well! Is there any saturation of the sound in this pedal ??? 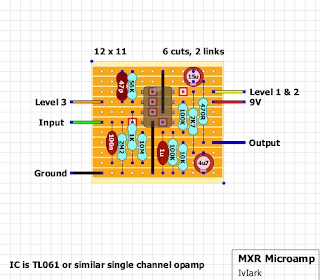 Are you using the microamp before your OD? If so, you'll only saturate your overdrive more, as there's no headroom left. hey i built this pedal its woks but i have Annoying sound can you help me ? Built this pedal and works really well and very pleased, just wondering what modifications I would need to do to run it 18V, many thanks for any help you can give! in any case you HAVE to be sure that all your caps are rated for over 50V. other than that i think you'll be ok...i think...!!! I will check my caps and have a go, will let you know how I get on and many thanks for your help! finished soldering. Voltages seem right. Only I don't get any sound. Just a buzzing. First I soldered pot's lugs 1 and 2 to the board Level 1 and two. And lug 3 to level 3. Tried resoldering lug 1 to ground, lug 2 to output and lug 3 I left in level 3. Same!!?? Dunno about 3pdt switch. I soldered it as shown in offboard wiring. Any suggestions on what could be wrong? Hi guys, built it two times.. it works, but I get that annoying POP all the time. Tried even without leds, with different pulldowns, with in DC cap... same story. What can I do? I even printed a madbean PCB and the result it's the same. Is this a schematic error? Could this be affected by my DC supply or my pedalboard ground? Actually, it does not make a big difference. Using the same label electrosmash uses, you have Zin = (R1//R2)//(R3+input resistance of TL061). If you do the calculation for the parallel of 3 resistors, you get that with R1 = 22M you have a 6.8M of input impedance, and with R1= 2.2M you get a Zin of 1.8M (the TL061 input impedance is so high you can approximate the Zin with just (R1//R2) ). Both are actually good input impedances for this kind of application. You could also use a lower value, such as 1M and you won't tell the difference. That is because, as electrosmash explain, that resistor won't affect the frequency response: its use is just to avoid popping sounds when turning on the pedal. Is there a mod to use the inverted output of a tl072? I want a polarity switch for one of these ad boys in a loop!